Wildlife advocate Hank (Noel Marshall) takes cat hoarding to a new level, living in Africa with a hundred or so lions, tigers, leopards, and other assorted big cats in the one of a kind ROAR. Given his unusual hobby, is it any surprise Hank is separated from his wife Madeline (Tippi Hedren, married to Noel in real life at the time this was made)? As the film begins, Hank is anxiously looking forward to being reunited with Madeline and the rest of their family – daughter Melanie (Melanie Griffith) and sons John (John Marshall) and Jerry (Jerry Marshall). Trouble arises when the family arrives at John's home and he isn't there, finding instead his furry housemates. Madeline and the kids spend the next hour or thereabouts hiding in closets, lockers, and refrigerators, and when opportunity presents itself, trying to get off the property to seek help. Meanwhile, John realizes too late that his family have probably stumbled into a situation they were unprepared for, but he's also busy contending with an evil hunter looking to thin his herd. 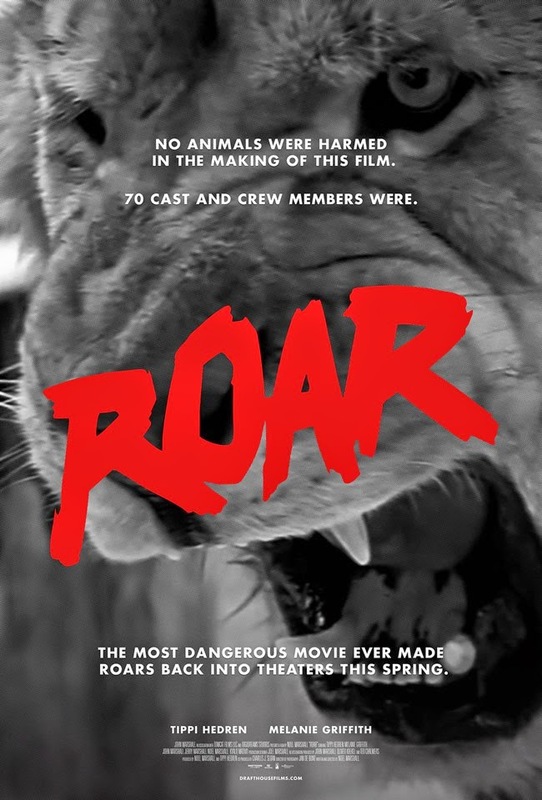 Originally released in 1981, ROAR was written, directed, and co-produced by Noel Marshall, whose previous credits included executive producing THE EXORCIST and THE HARRAD EXPERIMENT. He really lived with the cats and other animals who star in the film, none of which were trained. That perhaps explains why the animals had a tendency to maul the cast and crew, managing to inflict injuries of varying degrees on 70 people involved in the film's 11 year long production. Some of the attacks even make the final cut, so you can have fun trying to spot them as you watch. It can't be said that ROAR is an especially good movie, but it's such a one-of-a-kind piece of cinema that it's still a must-see. There's barely a script, the editing is choppy, and Noel isn't much of an actor, or even a compelling screen presence. Even a bonafide Hollywood star like Ms. Hedren, best known for her work with Alfred Hitchcock in another animal-centric thriller, THE BIRDS, doesn't have much opportunity to shine in a film that gives her nothing but trite, clunky dialogue to recite in the few moments when she isn't running around screaming. Nonetheless, this has to be the craziest family vacation home movie ever made, and while it may not be Oscar caliber, it's never dull. 2 ½ out of 4 stars.